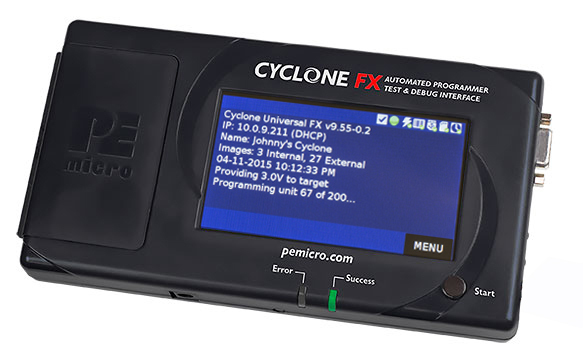 Our Cyclones are versatile production programmers that can be fully automated or used in stand-alone mode.. PEmicro offers both standard CYCLONE programmers and faster, more fully-featured CYCLONE FX programmers. At each level, customers can choose between support for ARM devices only, or ARM plus many NXP & STMicroelectronics 8-/16-/32-bit devices, which represents an incredibly wide arrray of device support. Our support center hosts the latest drivers for PEmicro hardware interfaces. Read the User Manual for CYCLONE Programmers. Visit the Cyclone product page for more info and downloads. Blazing programming speed saves you valuable time. Huge internal memory makes managing images simple. Enhanced security features help lock down your IP. An SD port gives you the convenience of expandable memory. Expansion ports enable unique, valuable plug-ins such as a barcode scanner for programming. Cyclone Control Suite for Cyclone automation and control, including advanced features. Read the User Manual for CYCLONE FX Programmers. Visit the Cyclone FX product page for more info and downloads. Visit the Automated Control tab on the CYCLONE or CYCLONE FX product pages for more information, or to download the corresponding Cyclone user manual for detailed instructions. PEmicro offers a few older models of Cyclones. The Cyclone MAX, Cyclone PRO, and Cyclone for STMicro have been discontinued. 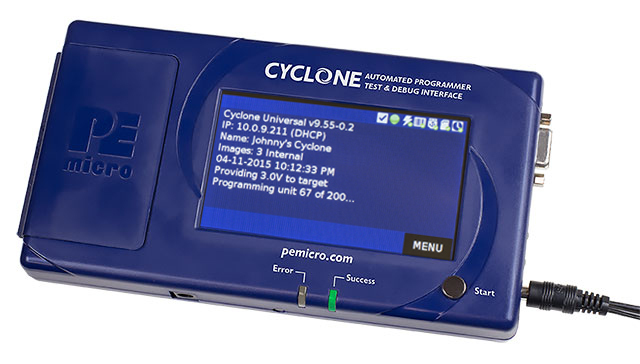 The models are all part of PEmicro's Cyclone Trade-In Program and can be traded in to reduce the cost of purchasing PEmicro's current generation of Cyclone programmers. The Cyclone for Renesas provides support for several Renesas device families.